The first attempt to continue the route through South Velebit has unfortunately failed! After a tip from one mountain biker that it is possible to reach Šugarska duliba with bike, the track has been made with start in village Konjsko and further to Šugarska duliba on hiking trail. From there it was planned to reach Panos, following gravel road downhill over Jelova ruja towards Rizvanuša and just before Rizvanuša try to go west on gravel road to Brušani and from there over Terezijana road to starting point. The plan has been made but with too many unknown facts like the very trail from Konjsko to Šugarska Duliba which is impossible with bike. Start was on the crossroads between roads Karlobag – Gospić and Konjsko from where I continued towards Konjsko village. In the village I found a man with whom I had a pleasant conversation with funny beginning. “Excuse me, where is the track to Šugarska Duliba?” A question mark above his head. He measured me from head to toe, remained slightly longer on bike. “On the bike? In those shorts? You have to be mad, son!” In the end it reduced on warning regarding angry vipers, impassable path with bike and political situation in the country. But I had to try so I went back uphill to Theresiana road. First part is easy to ride but further I went up the rocks became bigger and more difficult to ride. Reaching the crossroads to Šugarska Duliba and Baške Oštarije I left the bike and investigated next 200m on foot towards Duliba. The road becomes a trail with thick bushes which is really impassable. I continued with bike to follow Theresiana road towards Oštarije but here I also didn’t have much luck because it was impossible to ride on that rocks uphill. This section I will definitely try downhill soon. So it ended this year’s route on Velebit with 10 km ride! 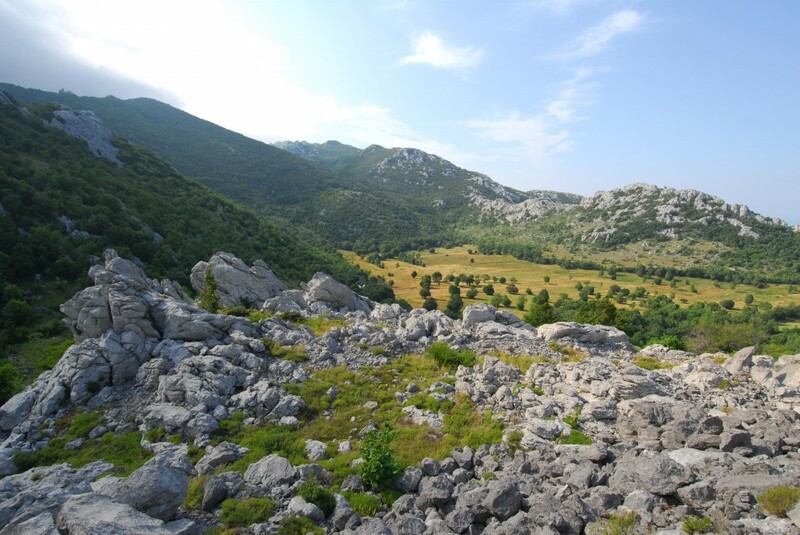 The willingness is still present and I will try to find a route which leads towards south Velebit as the goal is to cross whole Velebit from Vratnik to river Zrmanja.